Review Summary: Good message, bad execution. It starts out as a corporation polluting the ground water and water in the canals and a father investigating his daughter's wrongful death. The film rapidly deteriorates when the stars begin to showboat. The movie then goes on to fall down in a pile of shambles. 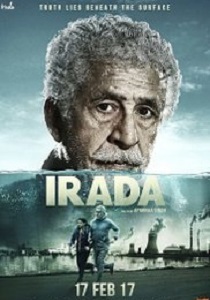 On an overall basis,'Irada' is a wilful display ofgood motive and powerful performances. But, thanks to the dull screenplay, slow narration and bad editing make this movie a painful task for the viewers. If intention is everything, you may feel kindly towards Irada. Unfortunately when it comes to a celluloid experience, story-telling is prime. Here, the film falters.